I traveled to Colorado for several reasons: family, friends, and outdoor fun, but one of my favorite stops was Tattered Cover Books in the LoDo neighborhood of Denver. I visited twice in the space of a week. The popular two or three story store reminded me of an old, well-funded library . . . comfy chairs, experienced woodwork, creaky floors. No one minded that I sat for a while to sample a copy of Cheryl Strayed’s “Wild”. A clunky looking machine seemed at odds with the shelves of booksand intellectual displays. Exploration revealed it to be a copy/binding machine with which authors can self-publish their books. Nearby shelves were lined with books with front matter indicating “Printed at Tattered Covered Books”. The concept blew me away. Right there were the means to input your story, spit it out on paper, bind it in book format, and display it for sale. To be honest, the proof copy of my novel, RIM TO RIM, which I ordered from CreateSpace two weeks ago, is a better quality sample of a book than most of those behind the publishing robot. And the cost of printing one book with the machine was quite high. But still, it was all right there. 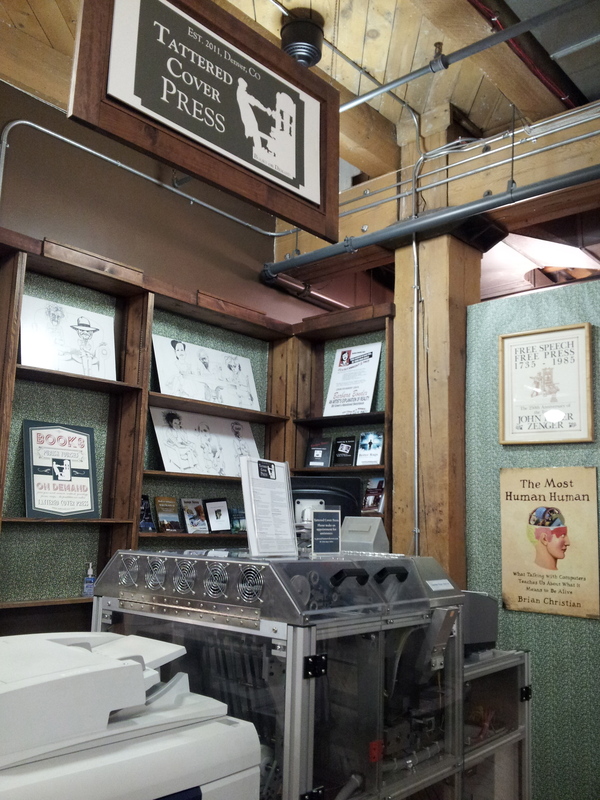 I mentioned the machine to my niece-in-law who used to work at Tattered Cover and is now a Denver librarian. We discussed the difficulties that new authors have in getting their voices heard. She advocates that libraries help authors reach their audiences and works toward giving them support. Her ideas seemed very innovative to me. Maybe libraries could have a self-publishing machine….or link their websites to local author’s e-books. Some already provide meeting rooms for writer’s groups, but how many do a good job of hosting book signings? How many use their expertise, advertising budget, and networking abilities to market local authors? When I offered a free, four-author’s panel discussion to my local library, they turned me down flat — “no one shows up to those things.” Not so. My Southland Scribes group attracted twenty-four attendees to our Oak Forest library event last May. With technology changing, what should be the future of libraries? What do authors need from these tax-funded entities? What should we expect? Exactly right, Tad. Sad, but I believe more people are reading and the new technology allows more authors to reach an audience. But let’s keep our room full of books. When I grew up, many books were kept on many shelves. Books were a display of wealth, and that wealth was knowledge. Now, books are kept in a remote computer called The Cloud, and a whole house full of books are kept on Kindles and Nooks that are about one fifth of a average size hard bound book.